Largest of all leopards, Persian Leopard is also amongst the rarest. 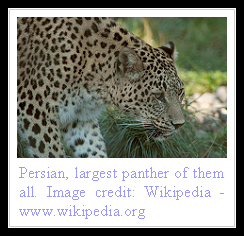 Also known as Iranian Leopard, it is found in scattered numbers in a number of countries extending from South Asia to Middle East, including some Central Asian states. A particularly strong animal, the Persian Leopard, Panthera Pardus Saxicolor, grows up to a height of near three feet and weighs as much as one hundred and fifty pounds, in case of healthy adult males. Not much is documented about any unique physical attributes of this big cat. It is similar in appearance to other members of its species, with a tawny coat marked with rosettes. It has seldom been photographed in the wild and rarely studied in detail. As a result not much is known about its behavior, hunting and reproductive profile, though the leopard is known to prey upon a variety of animals including deer, goat, sheep, camel, dog, mule, wild boar and birds. The elusive Persian Leopard resides in rugged mountainous terrains in Iran, Afghanistan, Pakistan, Armenia, Azerbaijan, Turkmenistan, Georgia and Russia. It is a secretive animal like all leopards and is seldom seen in the wild. Residing in a combination of hilly and forested areas, it is a solitary feline that faces a variety of threats in its natural habitat and is struggling to survive in nature. The splendid cat has had to withstand a lot over the years owing to the war torn conditions in its geographical range. This along with poaching for fur, prize hunting, poisoning, wild fires and habitat and prey loss has meant that there are fewer than thirteen hundred Persian Leopards in the wild today. Highest numbers are in Iran with around six to eight hundred animals reportedly existing. There are some conservation projects underway, with plans to reintroduce the big cat in Russia being one of them. At the moment though, the magnificent Persian Leopard is still classified as Endangered. i have a confirmed report of a persian leopard female shot near miranshah north waziristan ,pakistan in june 2009 as i saw the fresh skin .the leopard reportedly attacked a child in the fields near the house and was shot by the boys father the skin was later sold for 5000 pak rupees in miranshah.i saw it in bannu in the buyers hand and by the very large size ,light colour and thick fur recognised it as a persian leopard.there were reports of more live leopards in the area but thankfully there are no reports of anymore shootings or attack.the area is taliban controlled and is difficult to acces presently. it is sad that these endangered cats not only have to try to survive in normal circumstances but also to try and survive in the war torn territories which also makes it much more diffucult to survive. i only hope that there can be a unified action to try to help them stay extinct. im sorry i meant unextinct. Thank you for the help. I'm still having a hard time doing this assignment, though. But anyways I did get a few things for this and of course, I'll use you as a reference in my bibliography. doing a keynote project, this site was very helpful, sad they are going extinct, hope we can save them!